The most urgent issue at the moment is the life of White's group at the top. White 1 follows the principle of attaching when defending. Black cuts at 3 and White attacks with 4 creating an eye shape which Black destroys with 4. White 5 is a decision and a wrong decision. Playing at 8, White would have made the second eye. But White feels she is behind and thus wants to complicate the game. So 5 was played to further destroy Black's sphere of influence. But suppose White played thickly and got life with the dragon. Black would need one more move to enclose the white group completely here, but this is not that big and the game would switch to other regions. White has some prospects at the bottom and on the right side, so there was still a chance to win. Black 6 saves the stone and (what is much more important) takes away an eye. White makes an unnecessary atari with 7 and Black replies with 8. White then plays 9 to create a half-eye shape. Black replies 10 and that is, perhaps, the strangest move in the game. White expected Black to connect solidly at a. This move would deprive White of a second eye as well, with all the other advantages of being thick and solid. 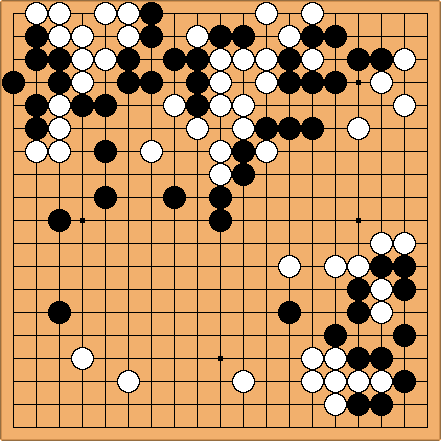 Instead Black made a move that left a hole behind and eventually allowed White to save stones on the left.